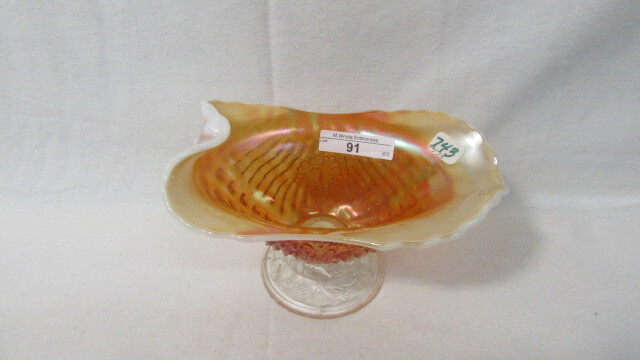 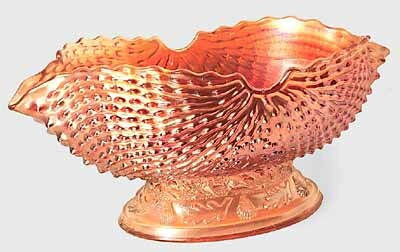 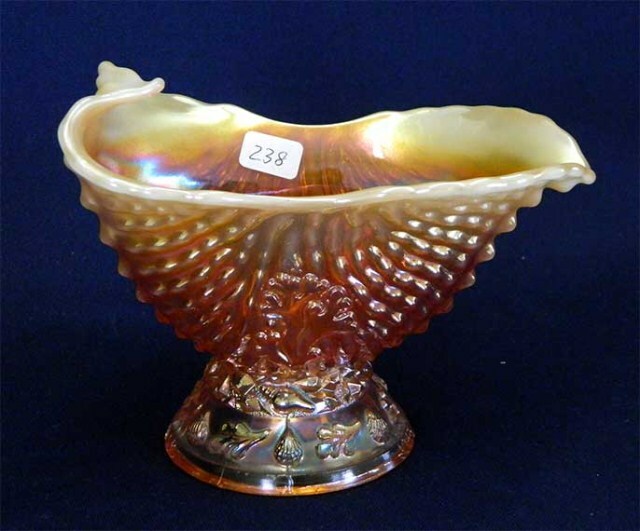 The Nautilus pattern predated the Carnival era and has been called Argonaut Shell. 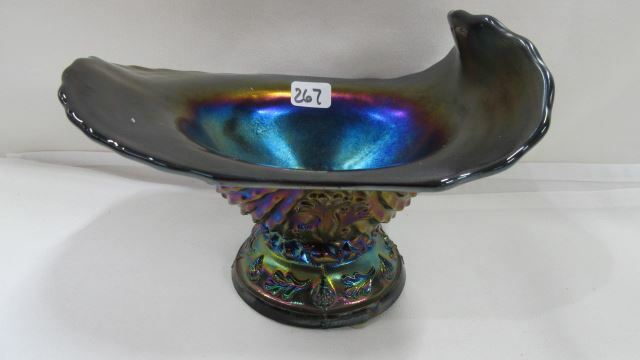 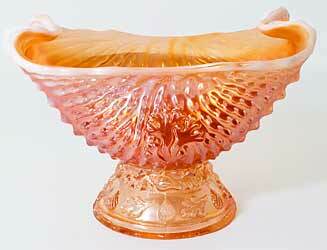 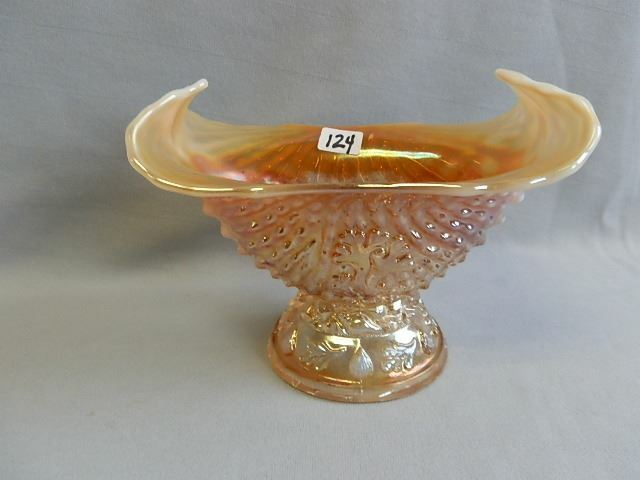 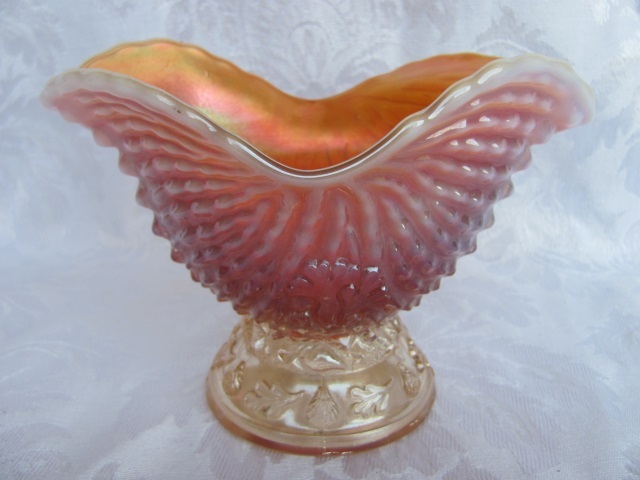 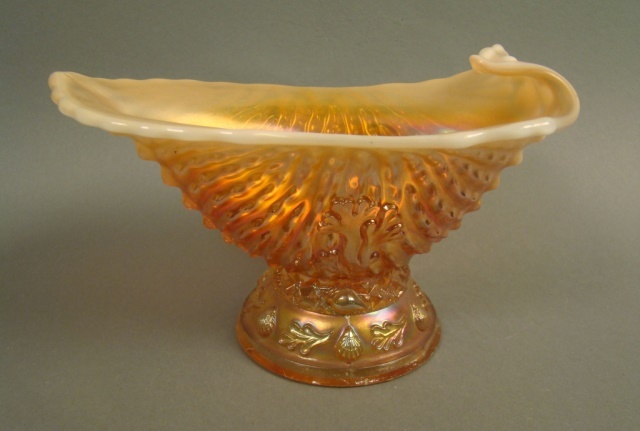 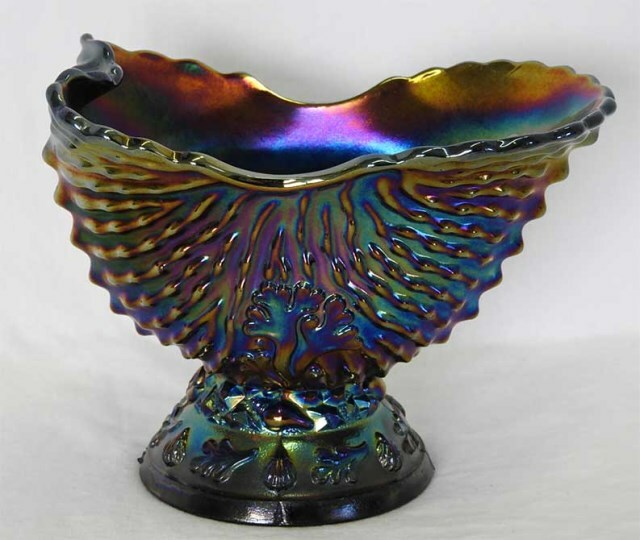 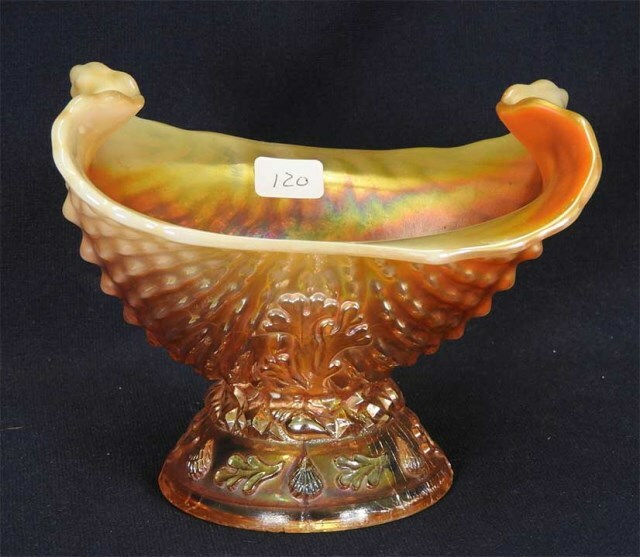 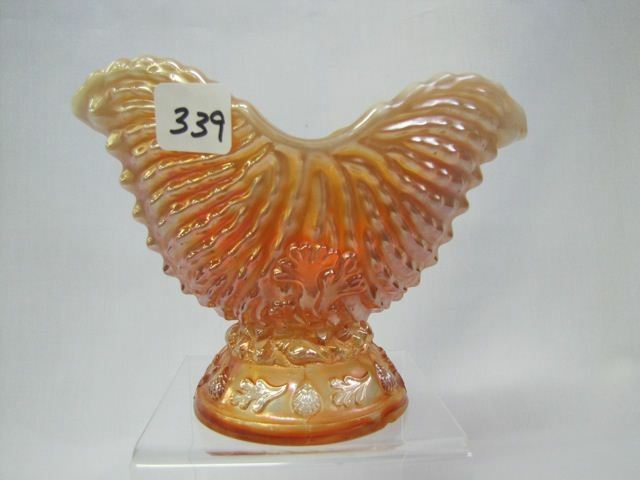 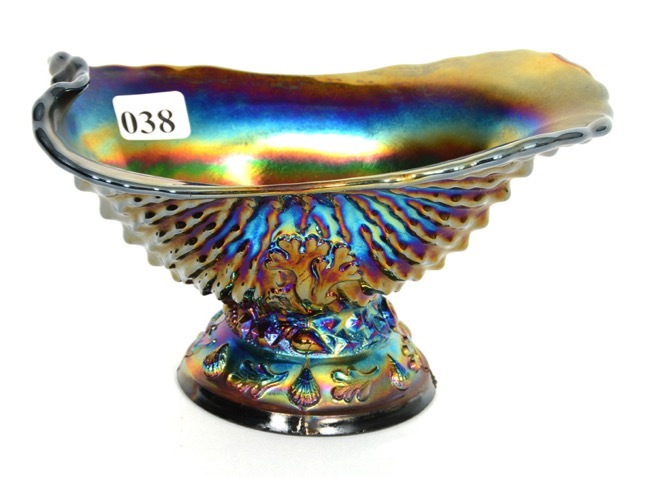 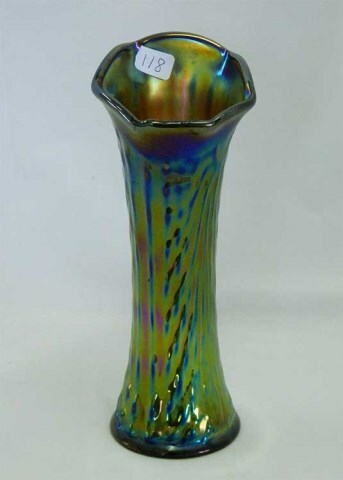 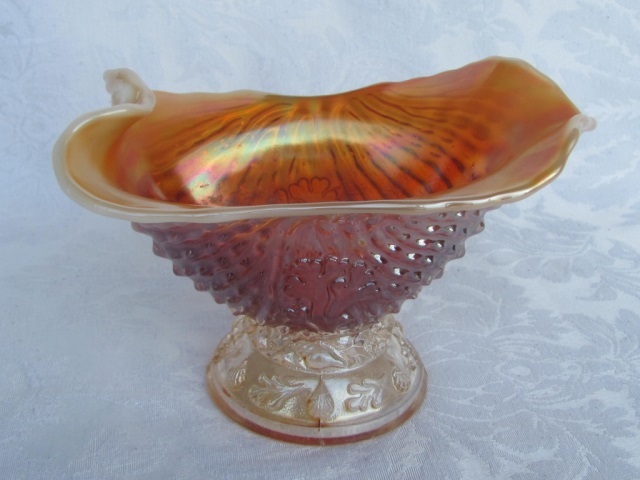 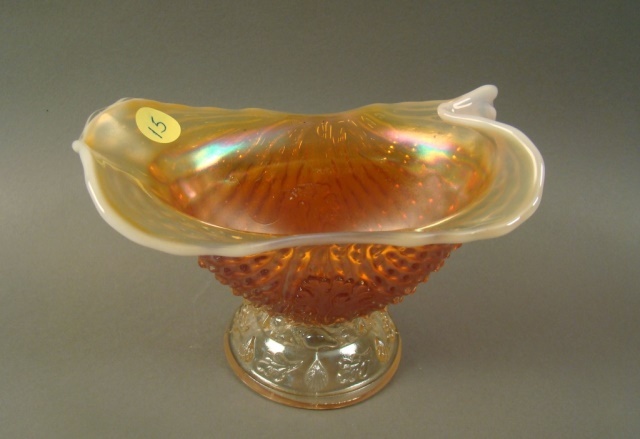 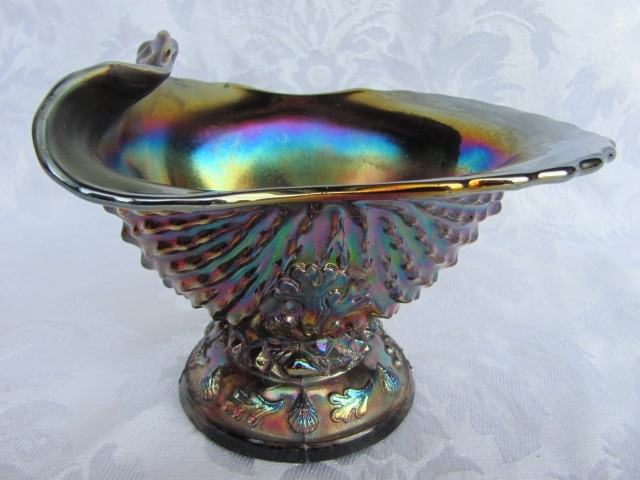 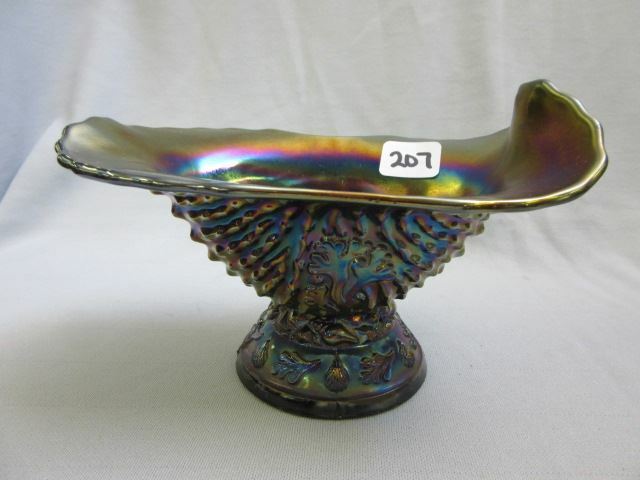 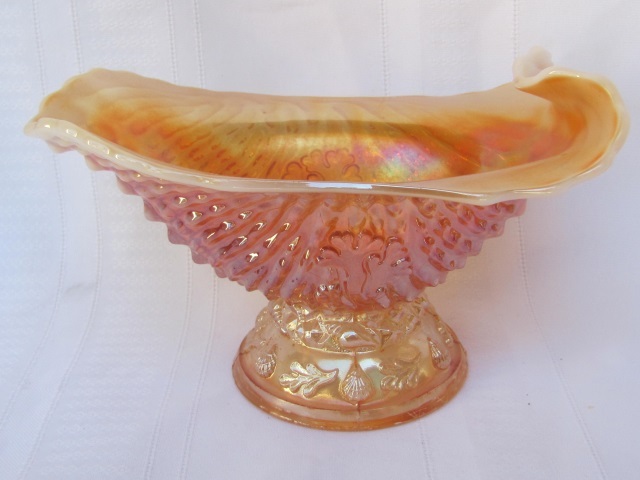 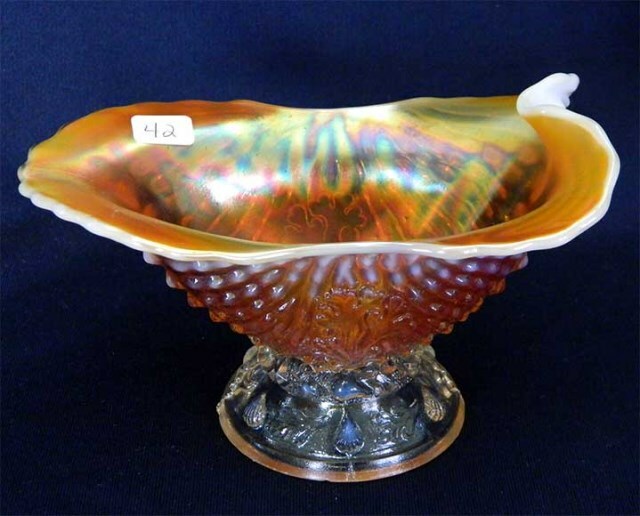 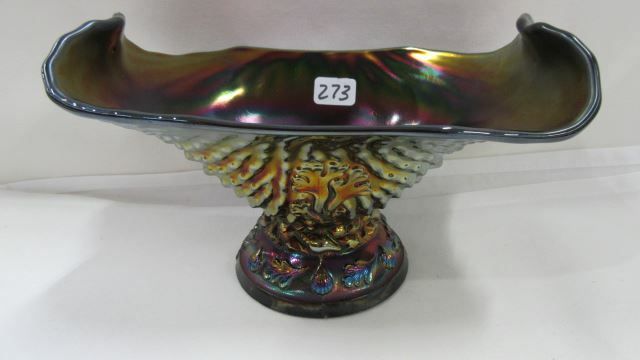 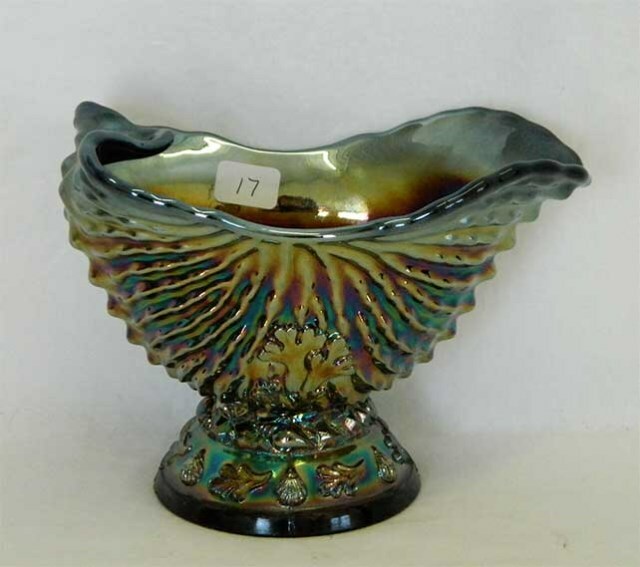 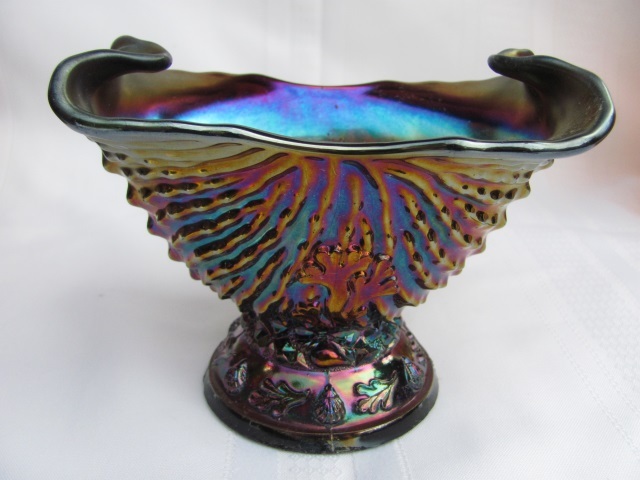 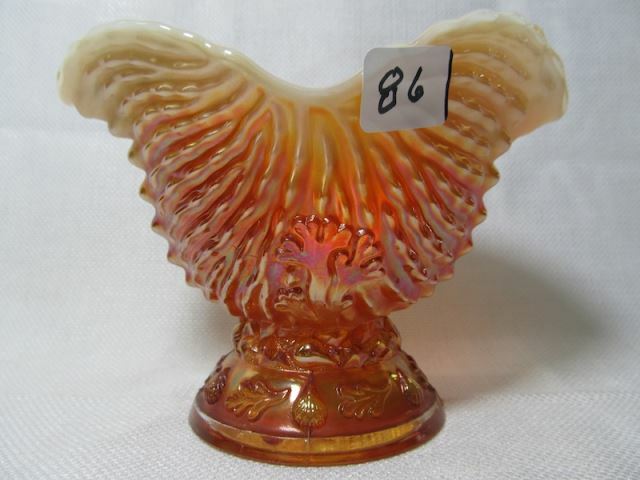 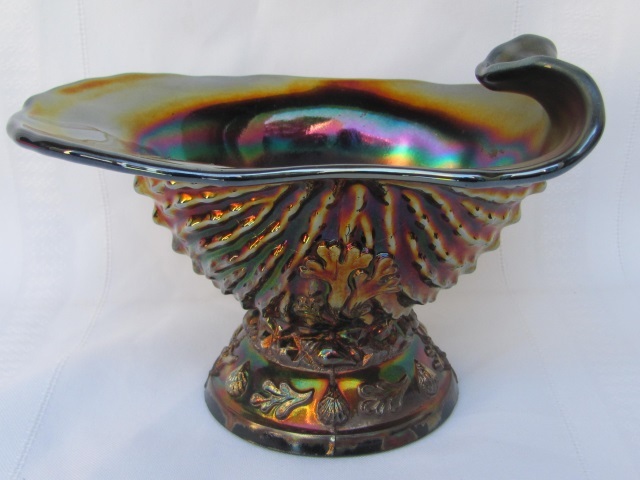 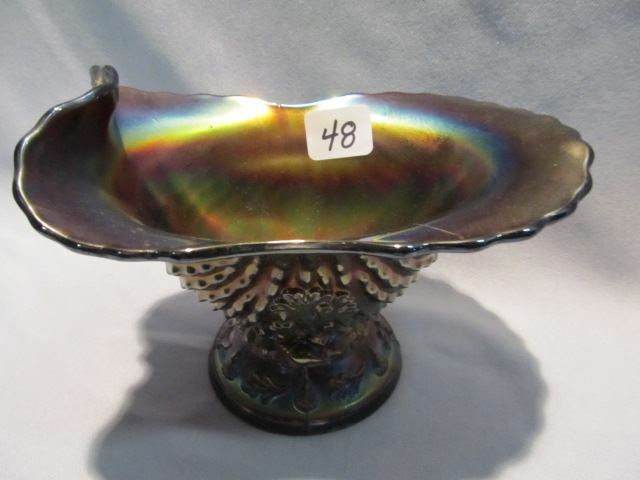 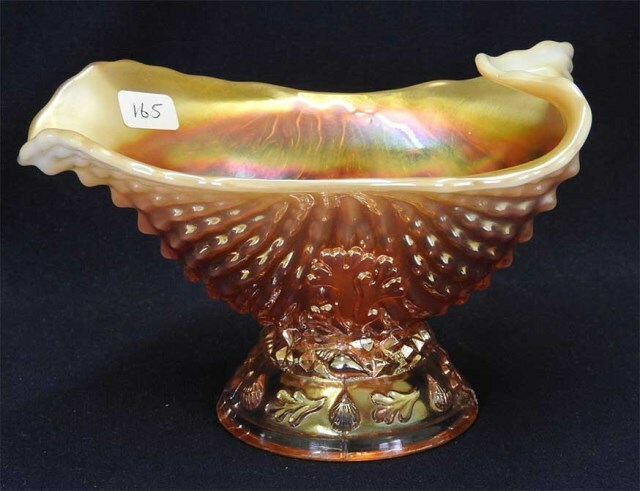 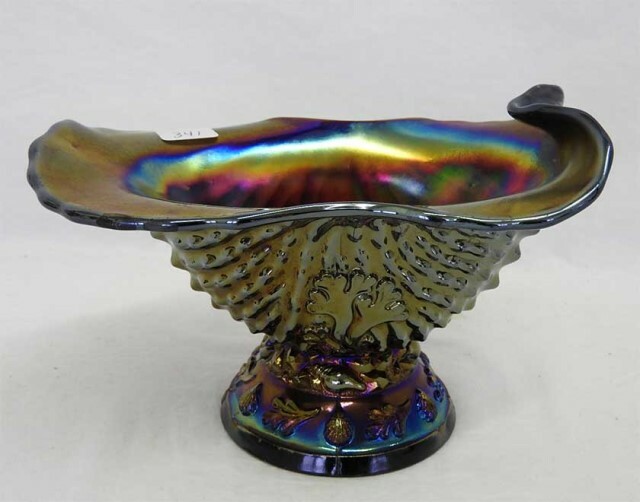 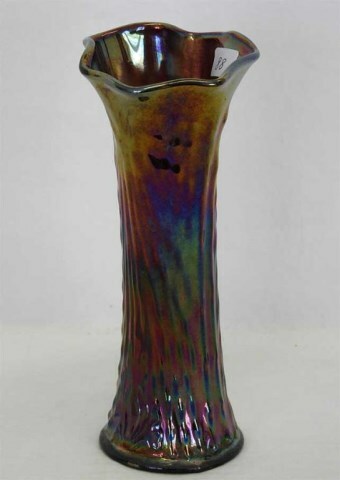 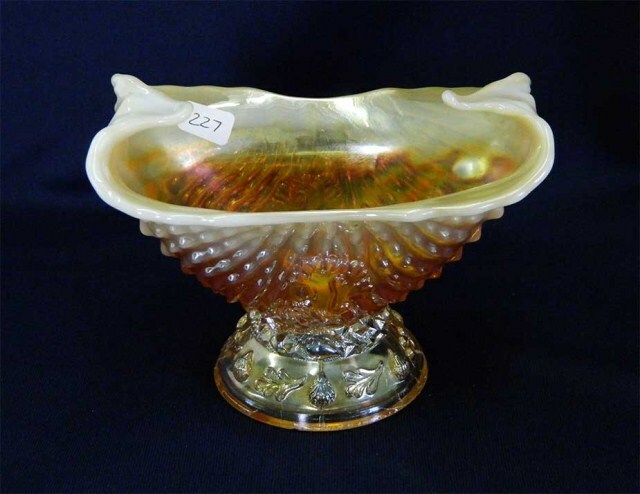 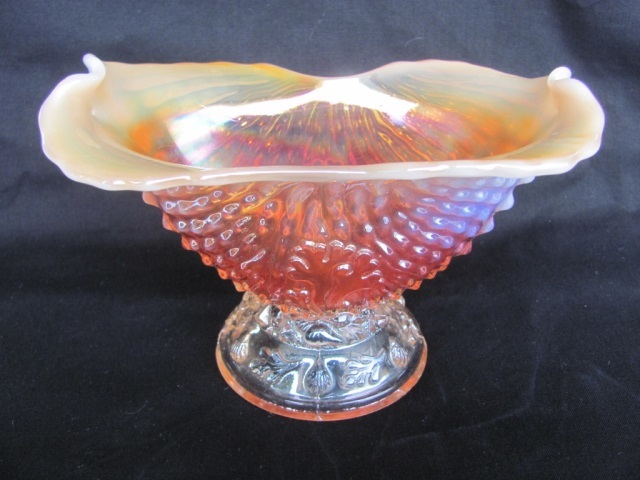 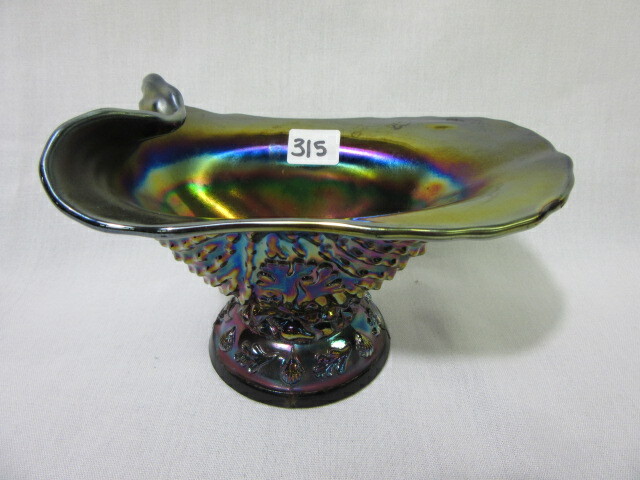 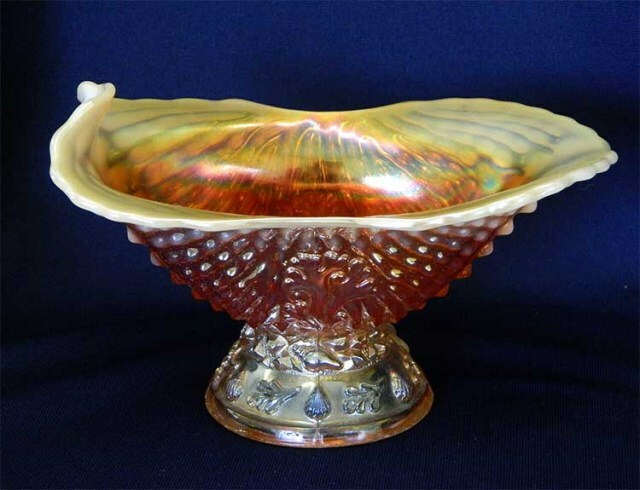 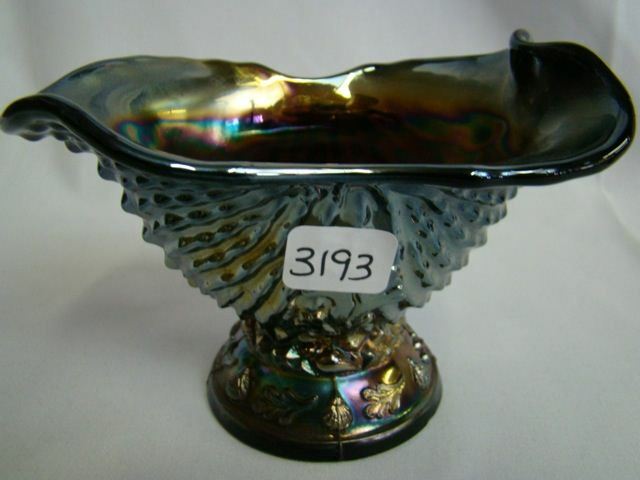 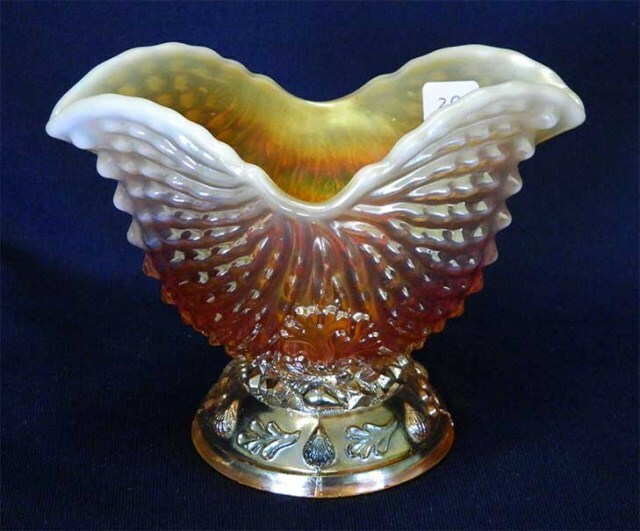 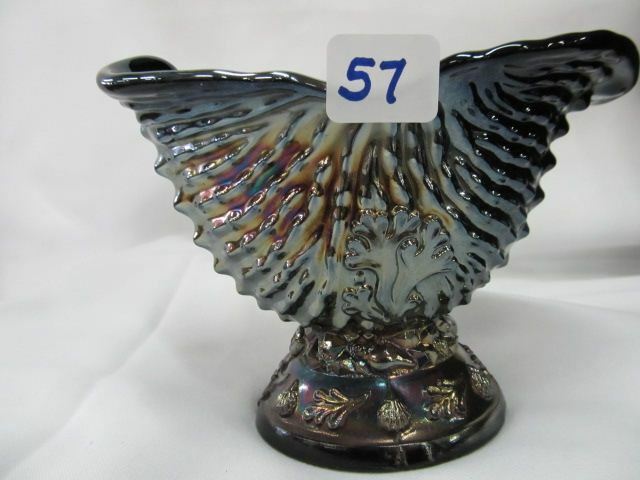 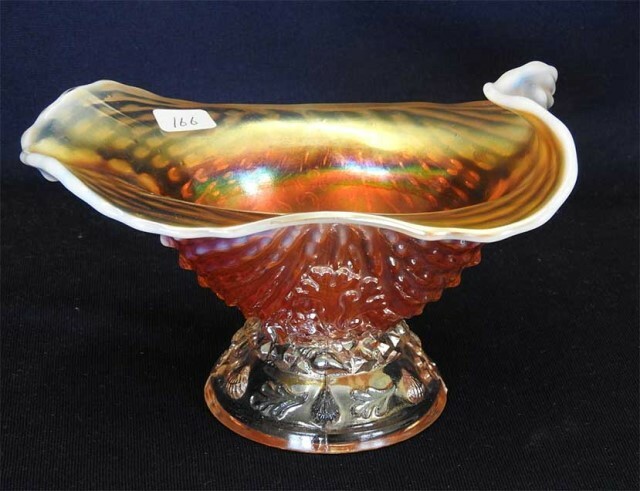 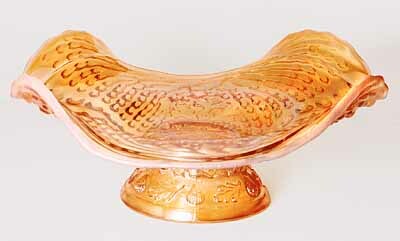 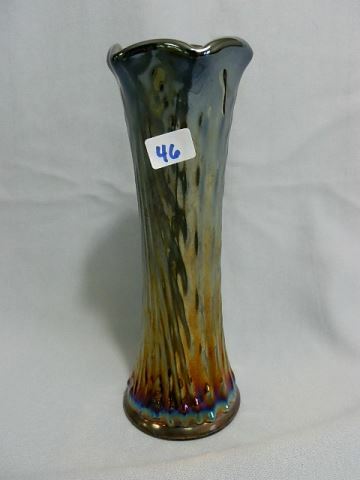 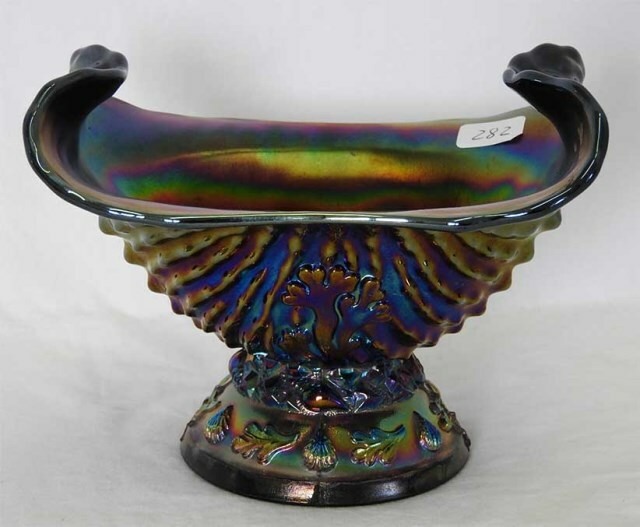 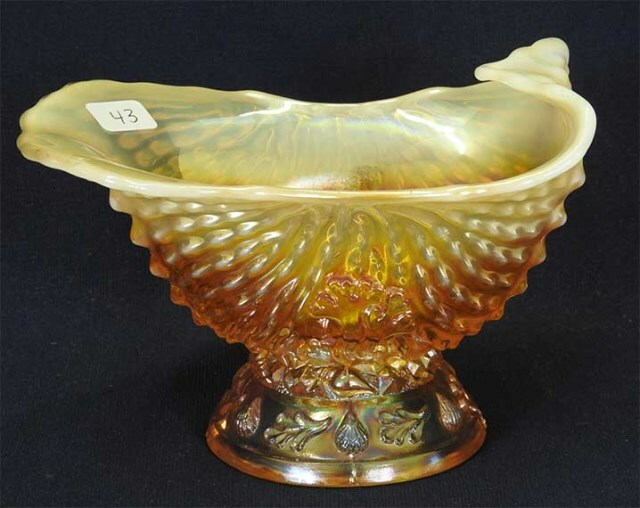 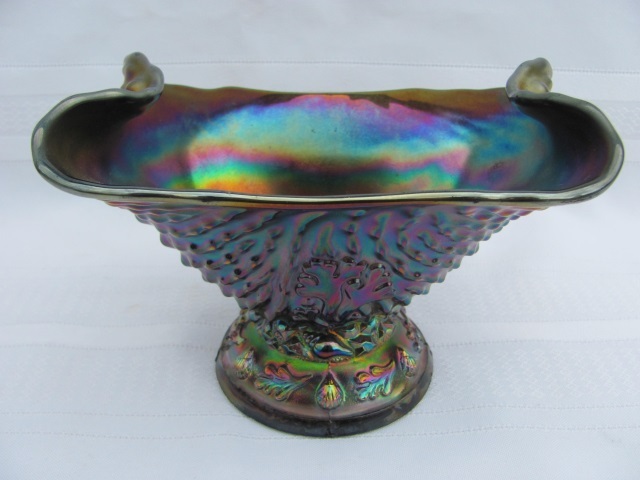 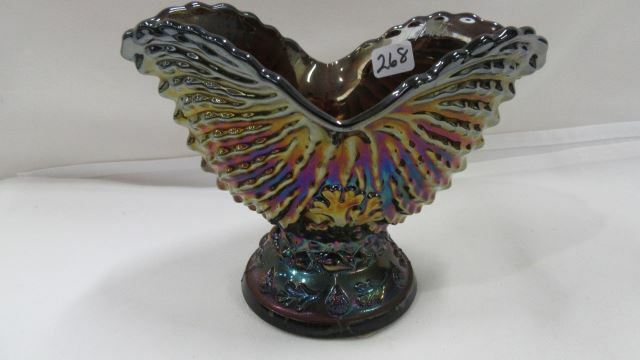 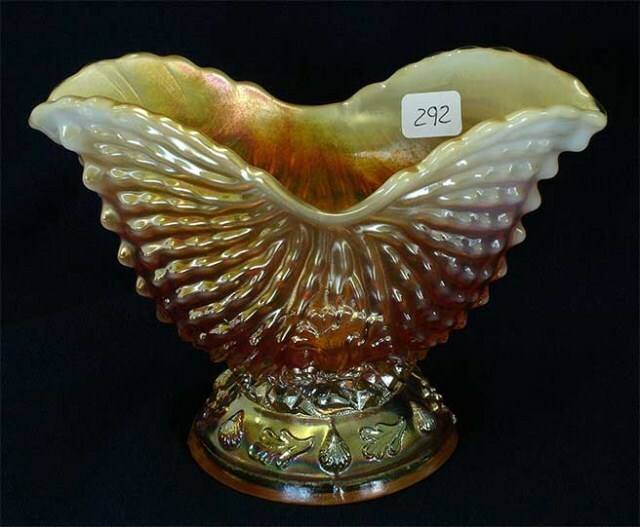 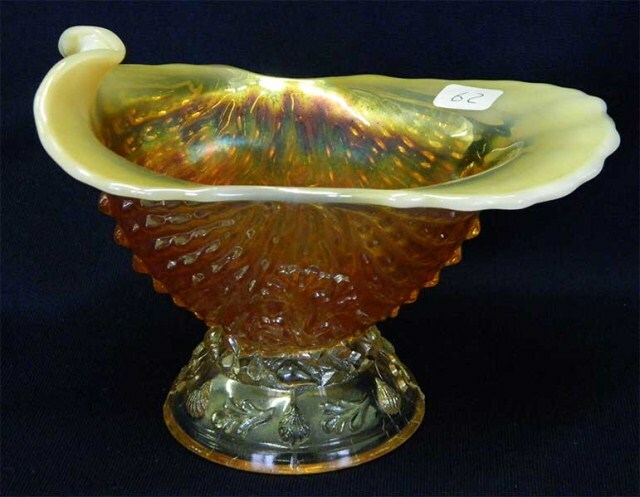 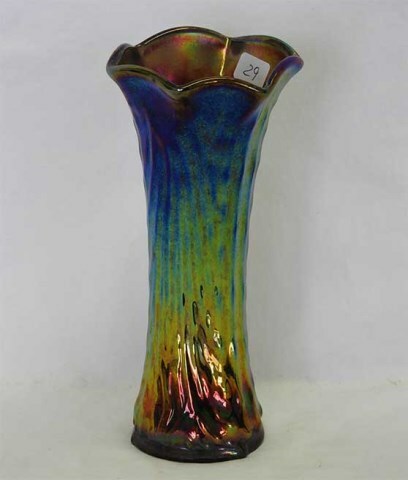 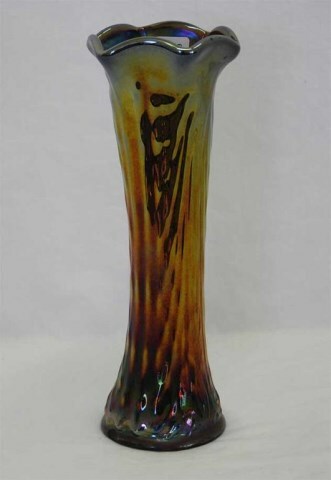 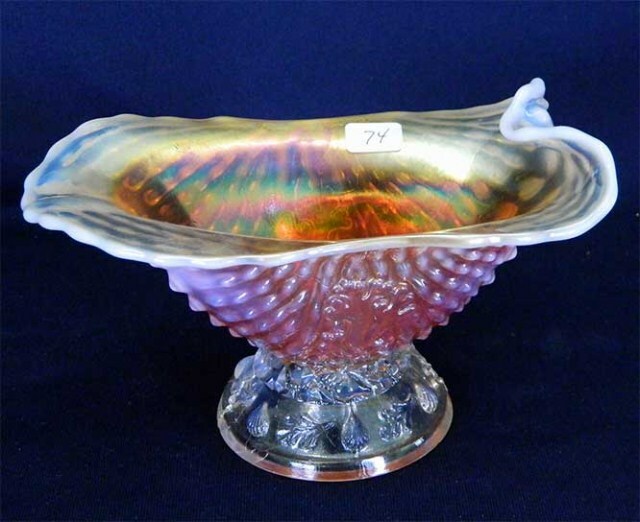 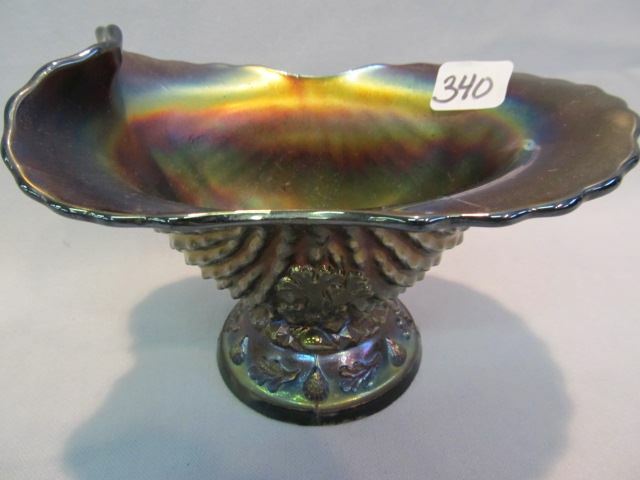 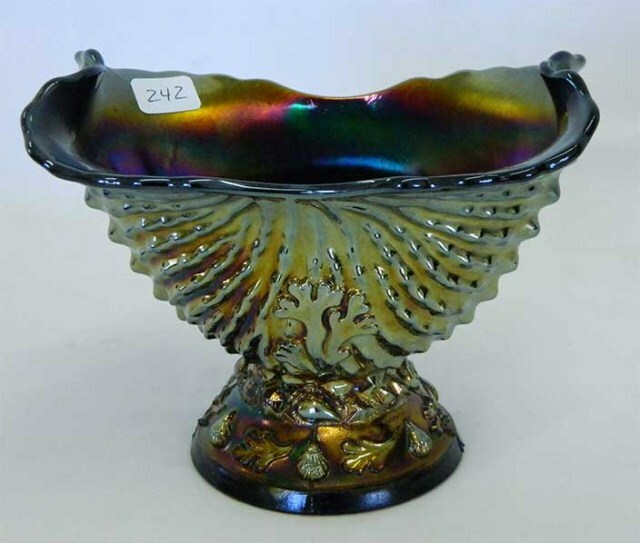 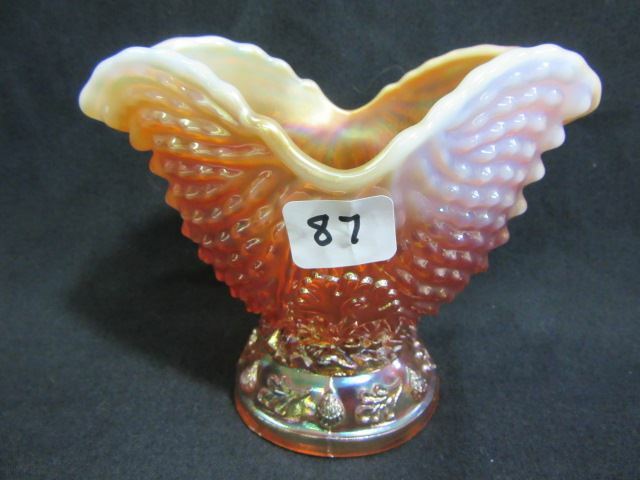 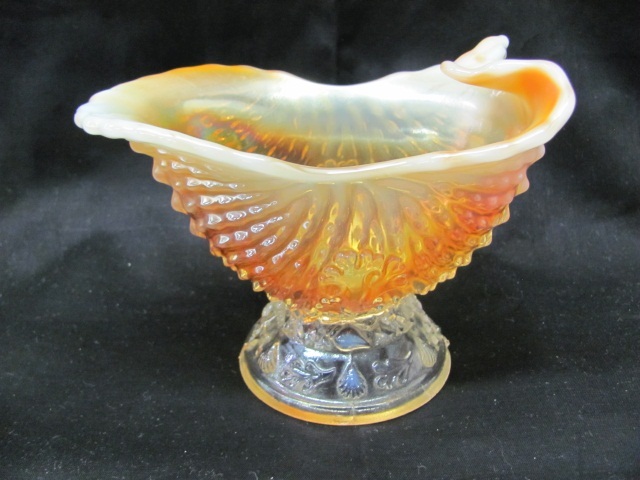 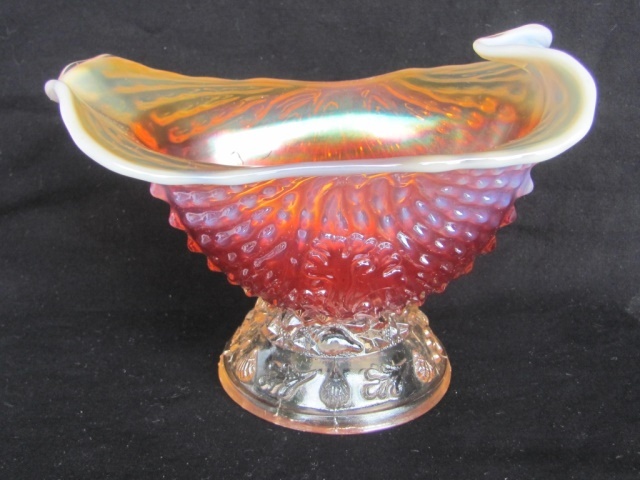 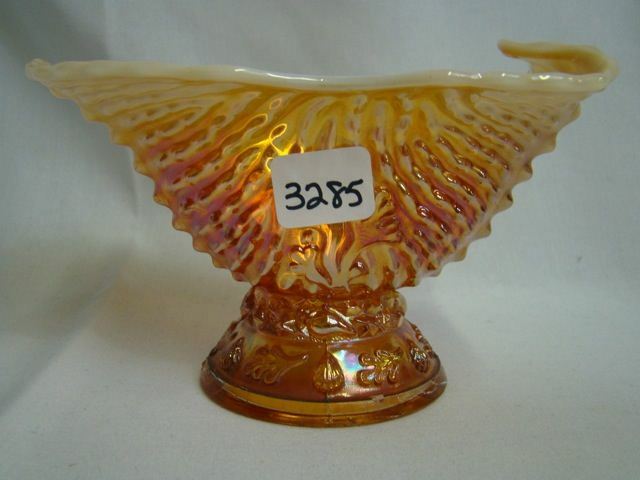 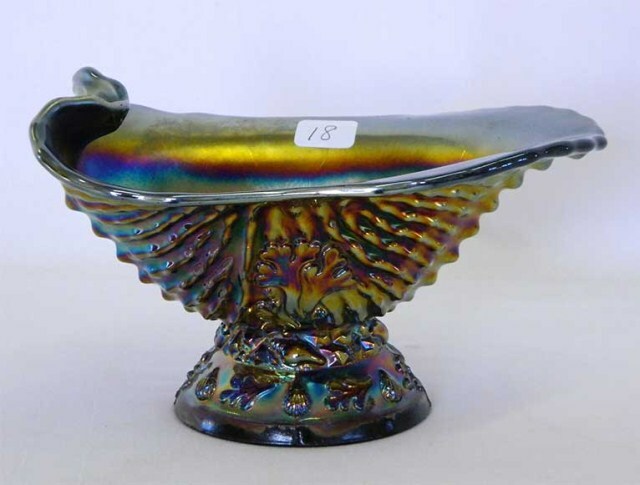 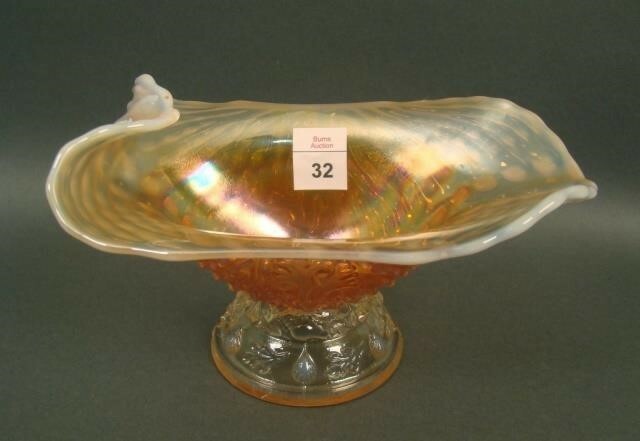 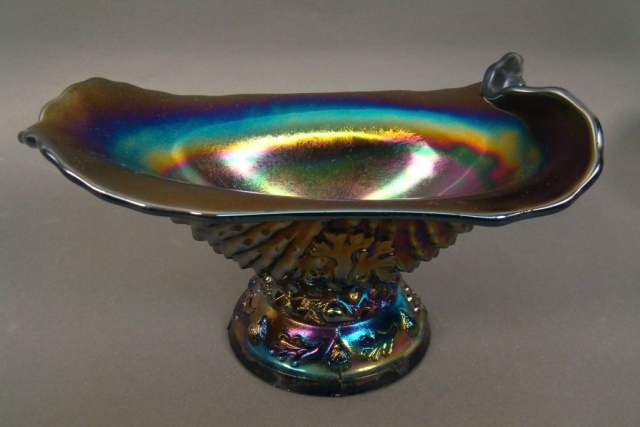 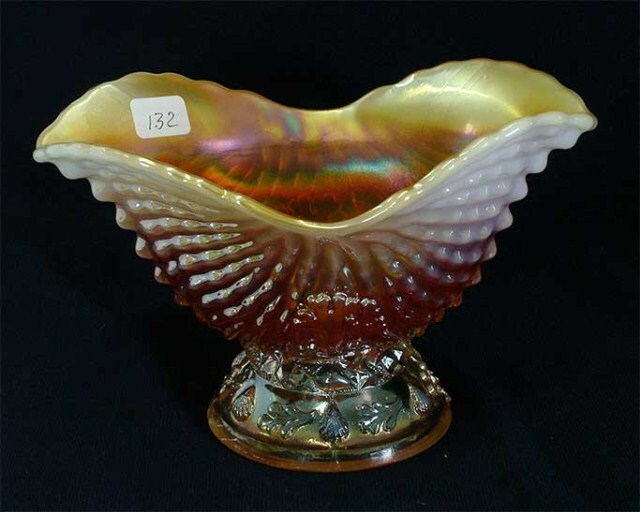 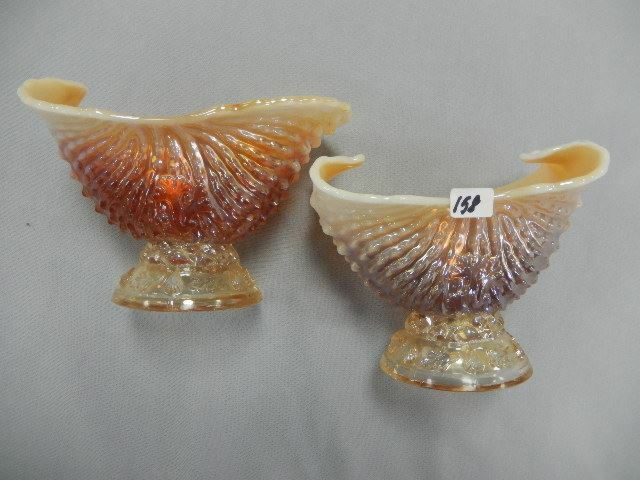 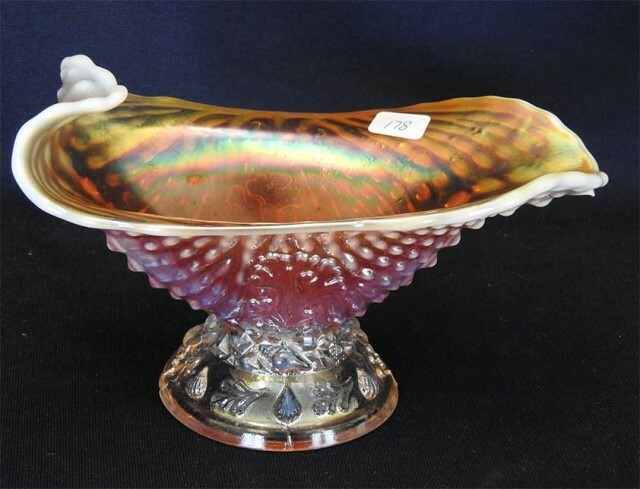 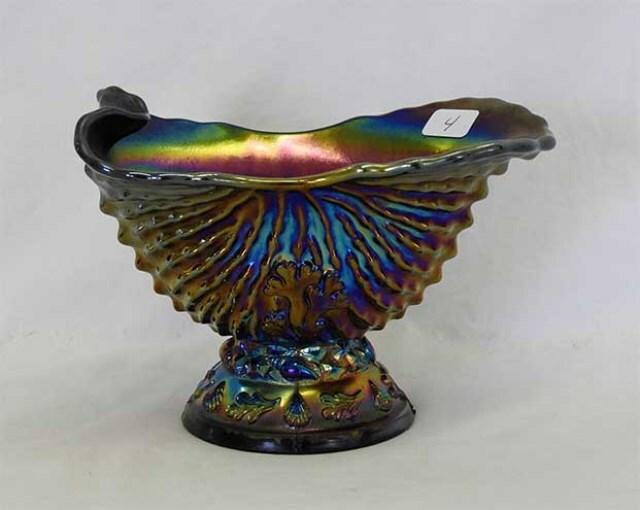 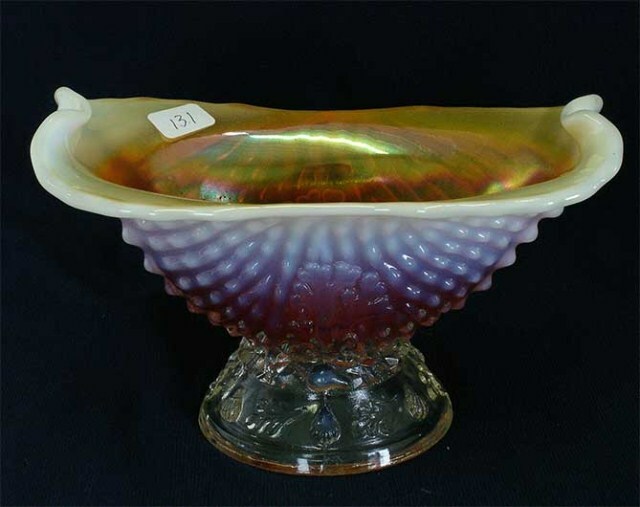 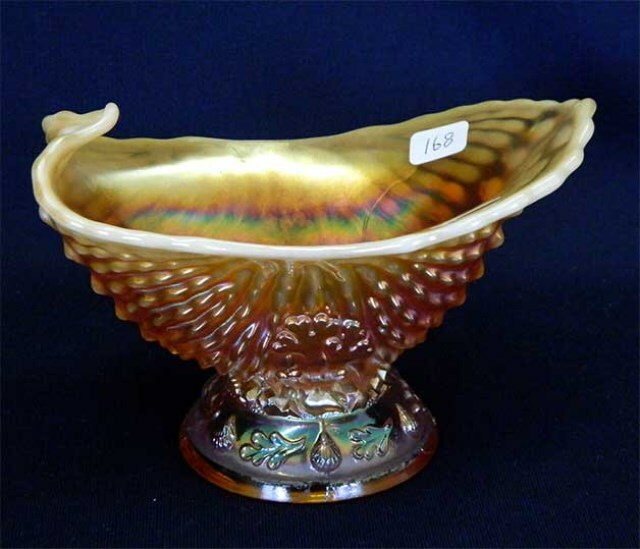 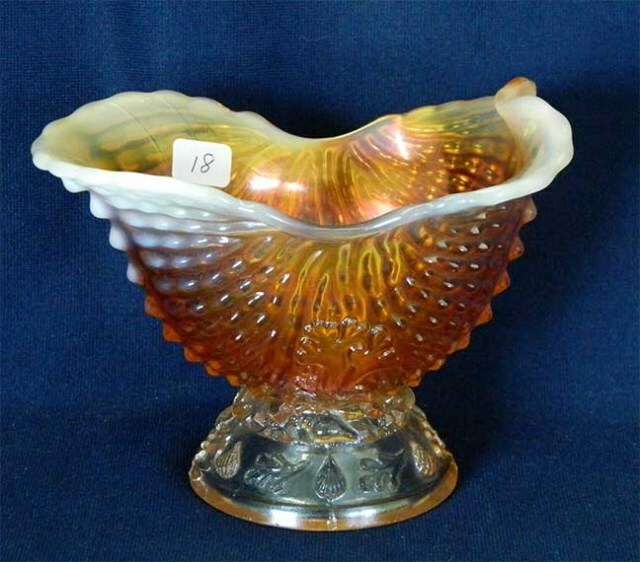 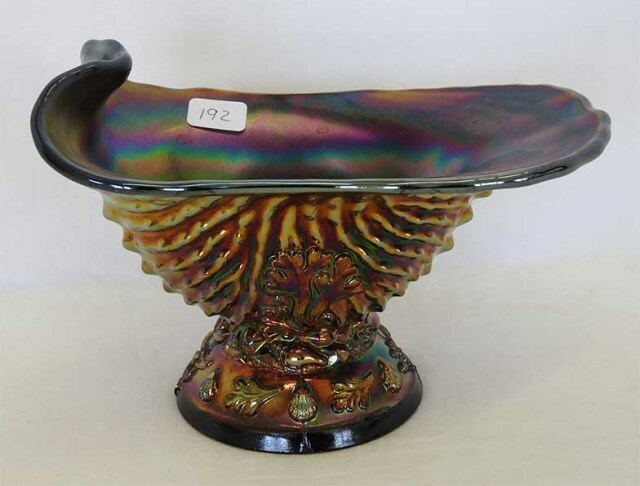 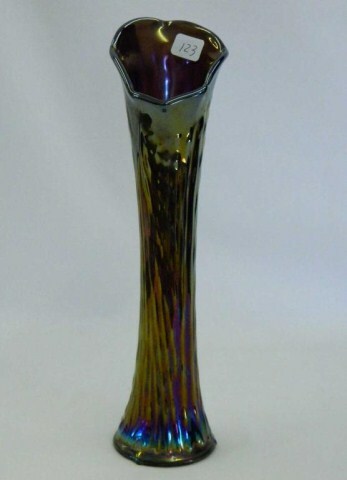 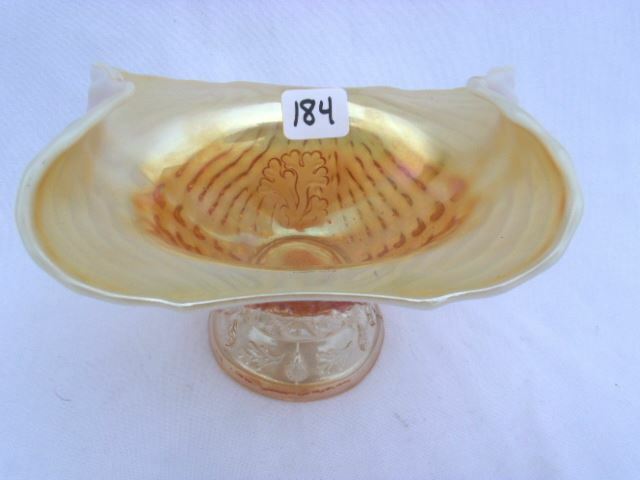 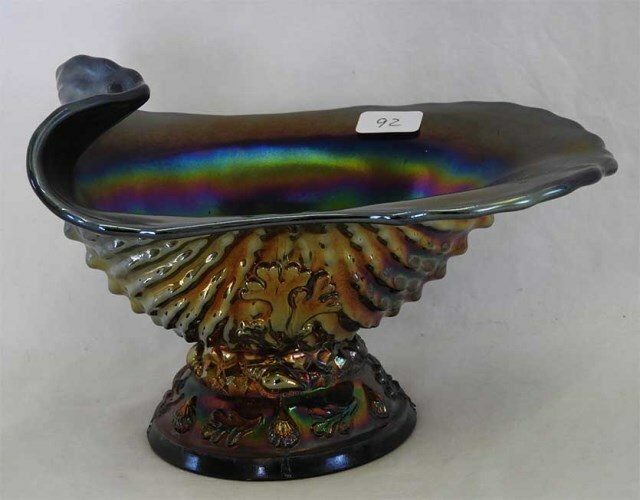 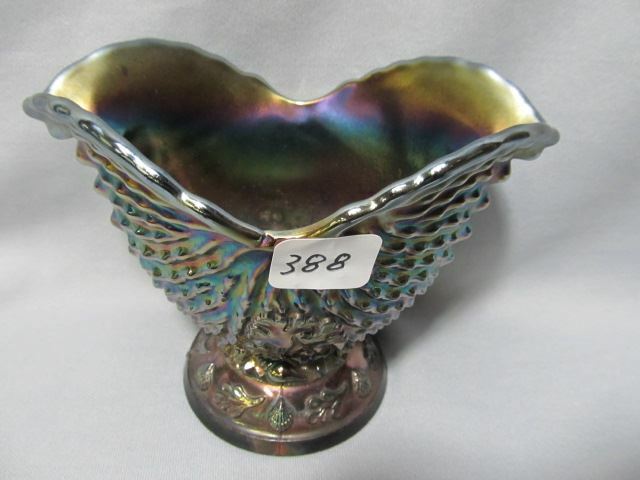 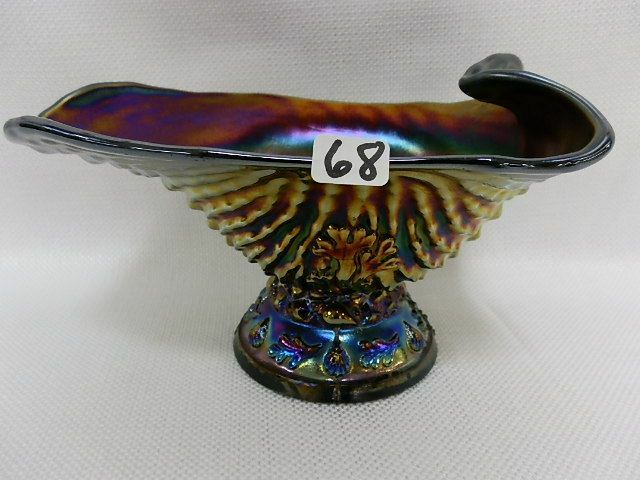 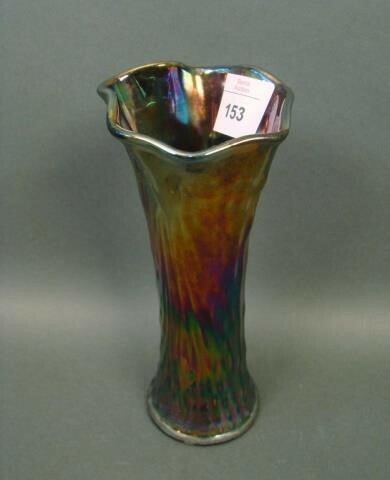 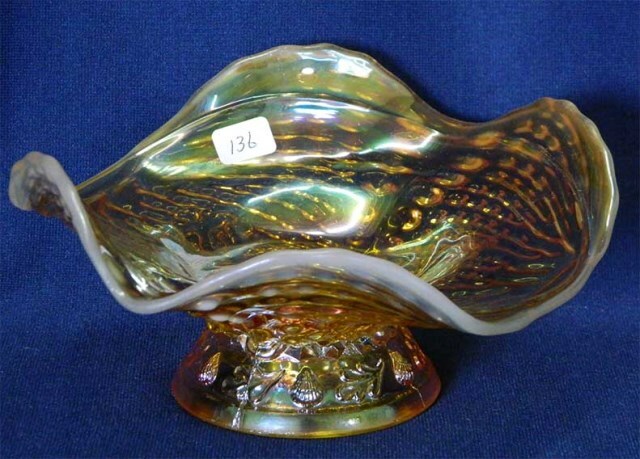 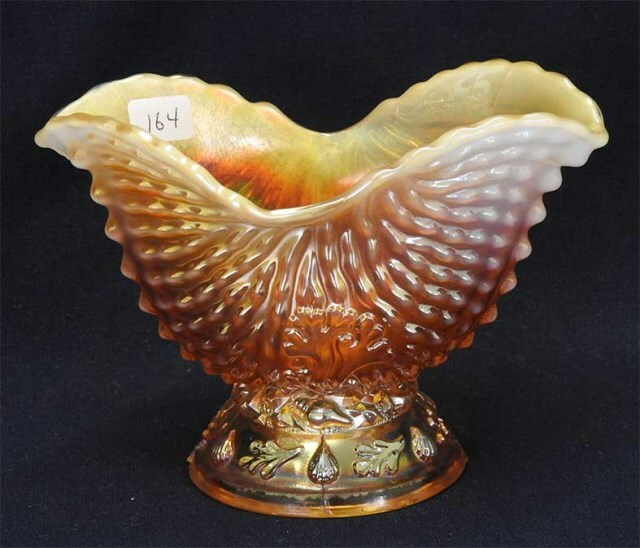 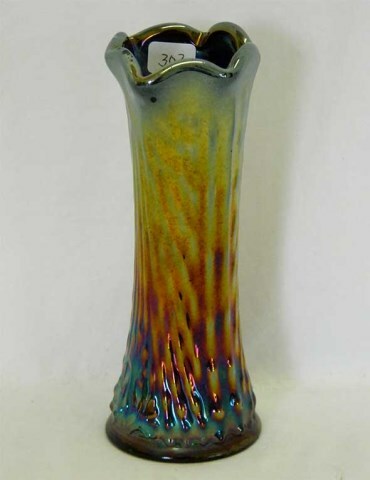 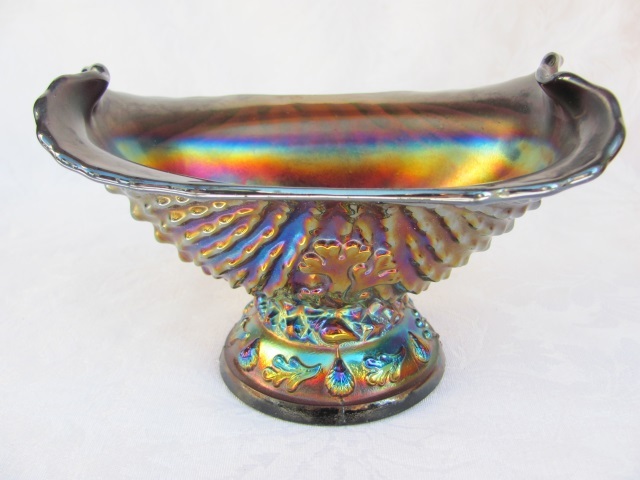 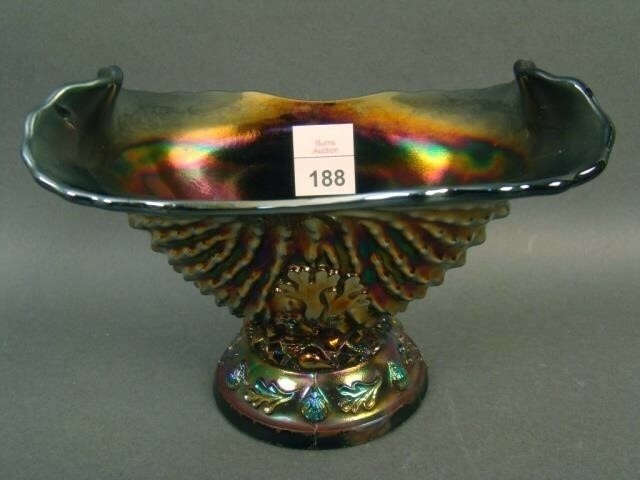 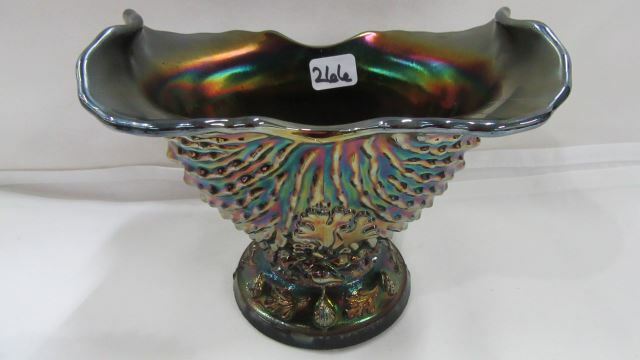 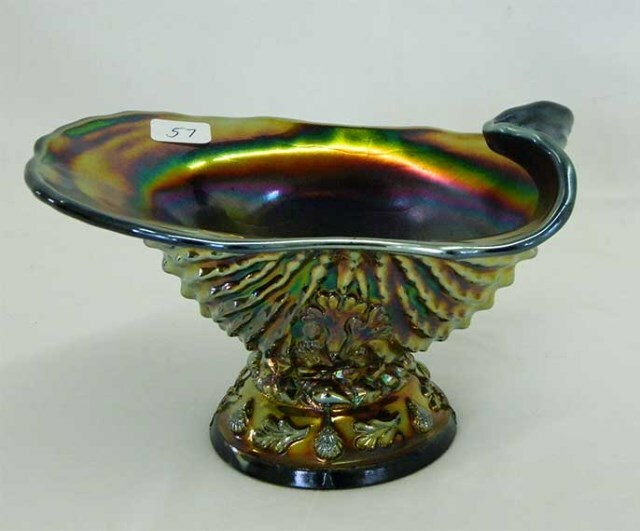 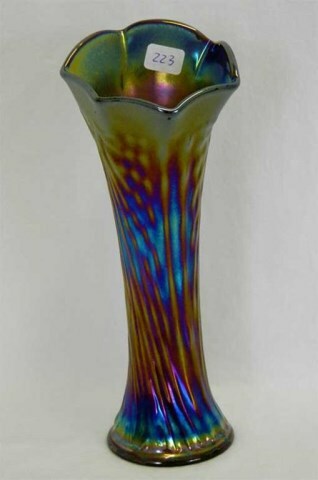 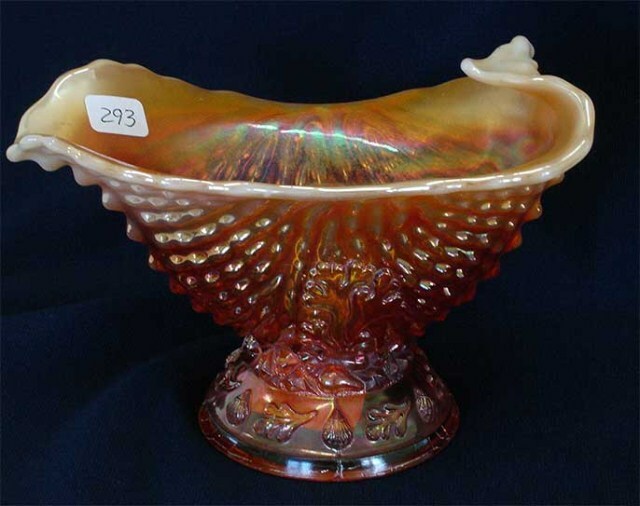 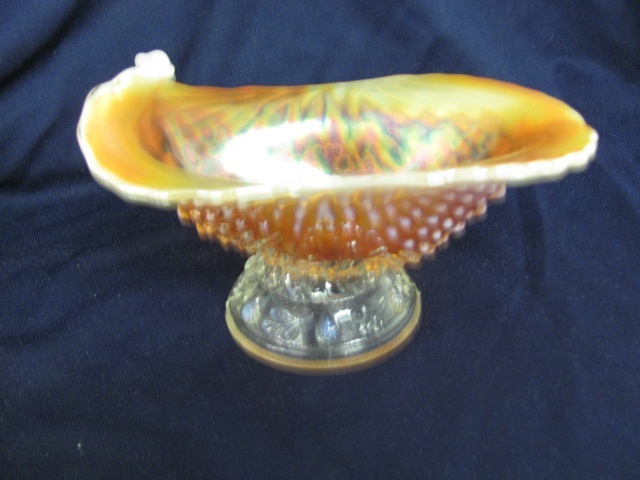 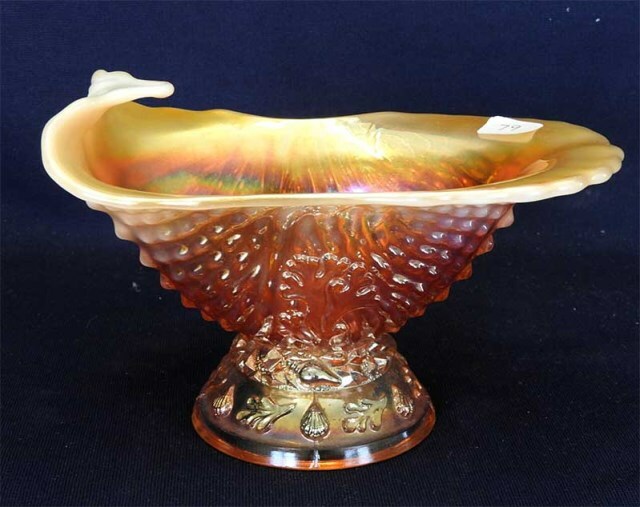 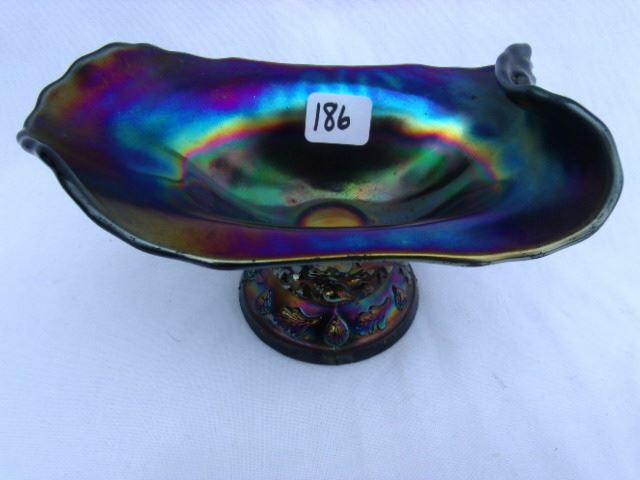 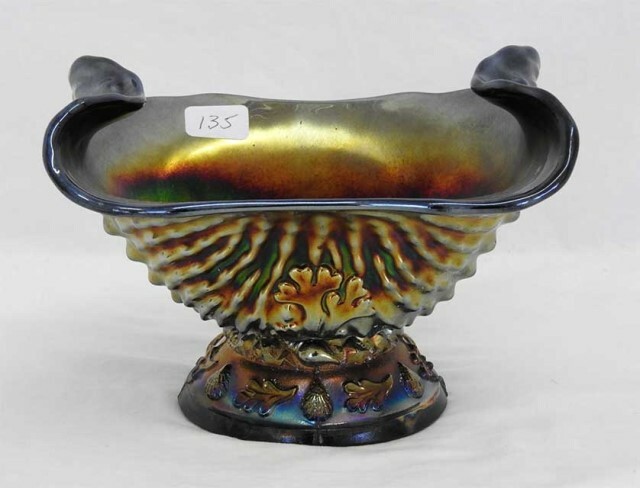 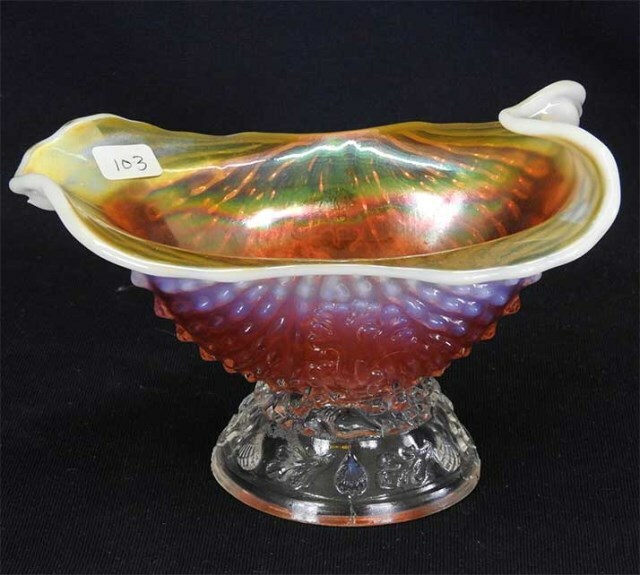 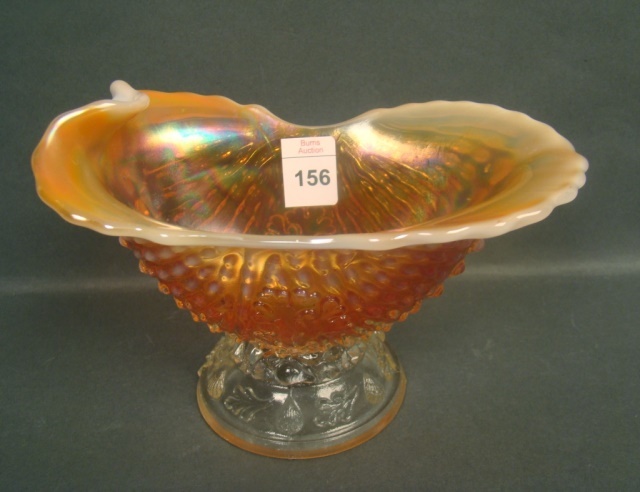 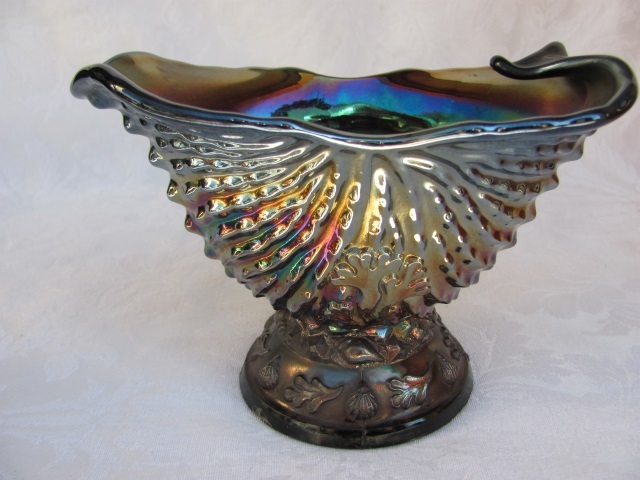 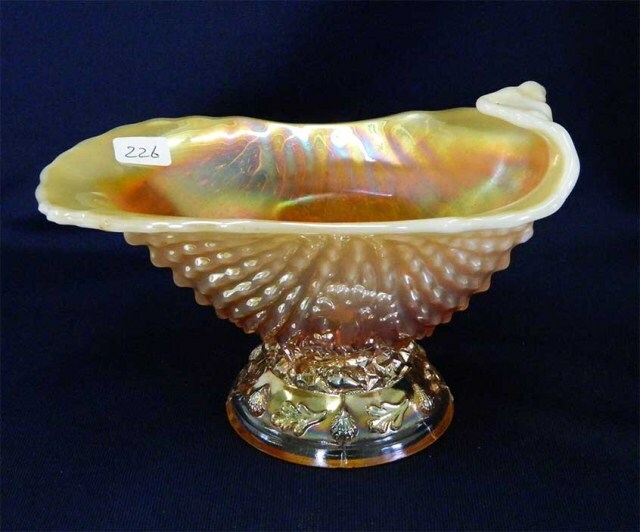 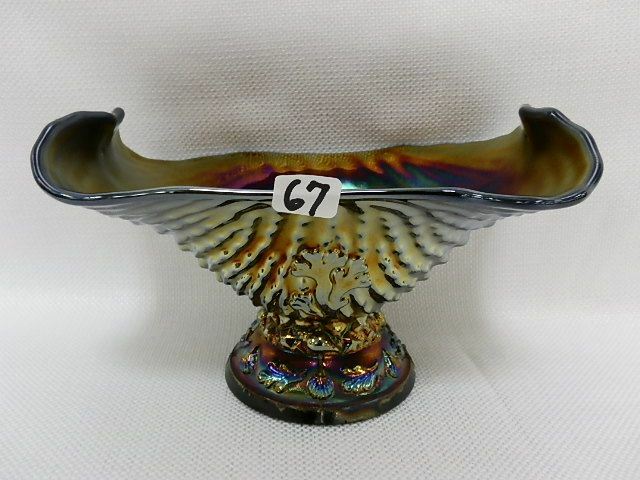 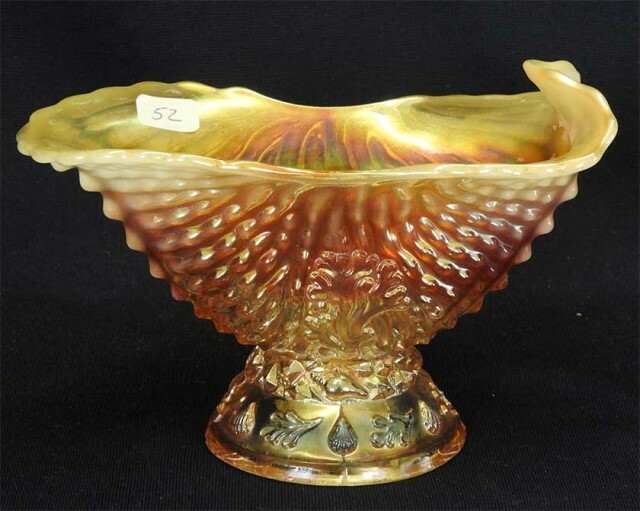 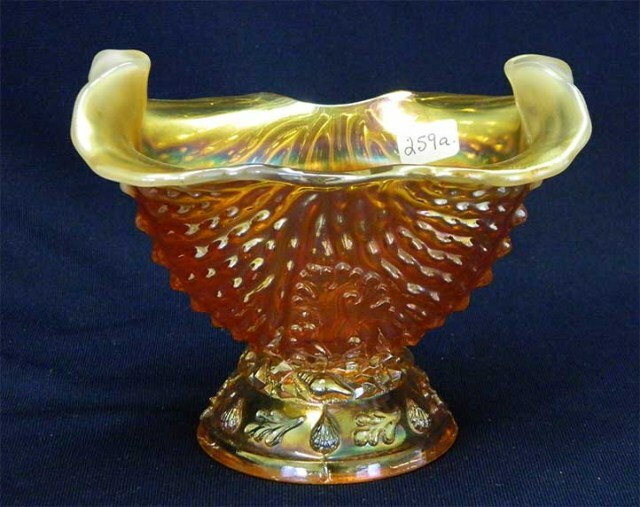 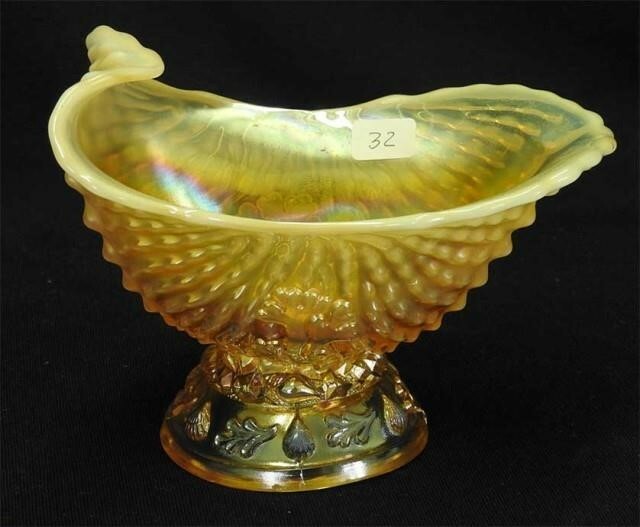 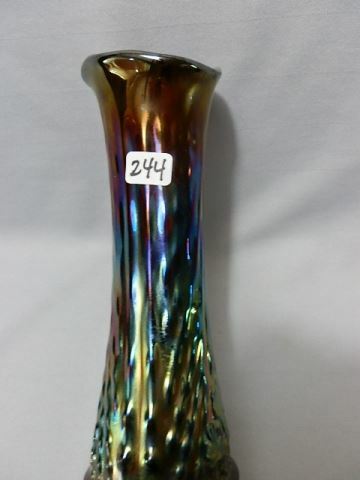 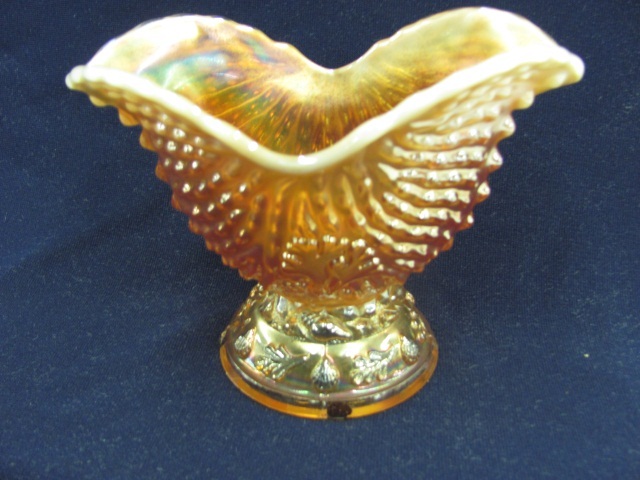 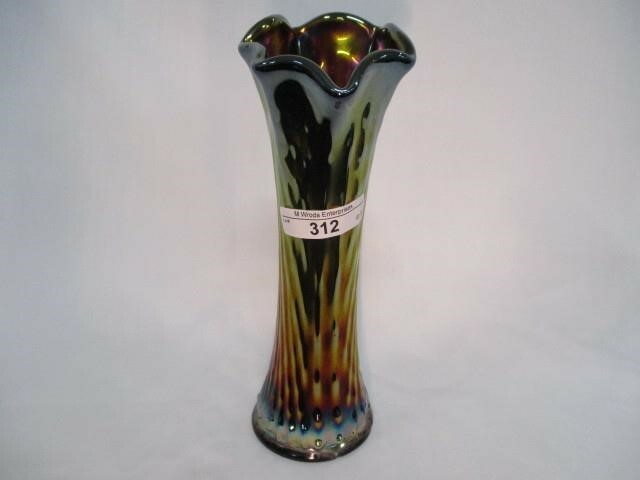 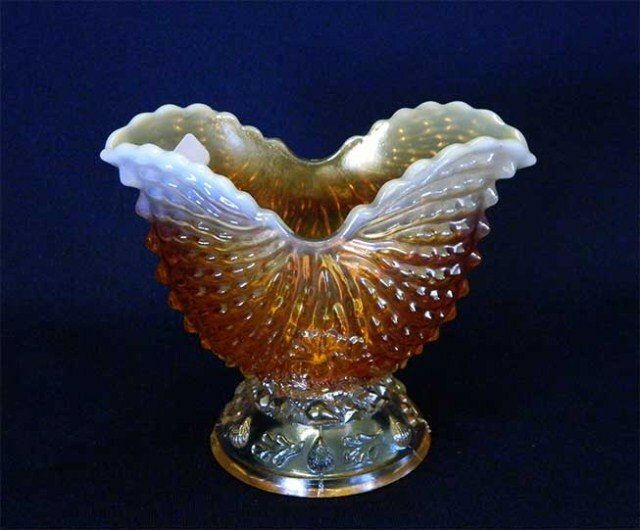 Northwood produced an extensive line in custard and opalescent glass–some molds have the early “Northwood” in script. 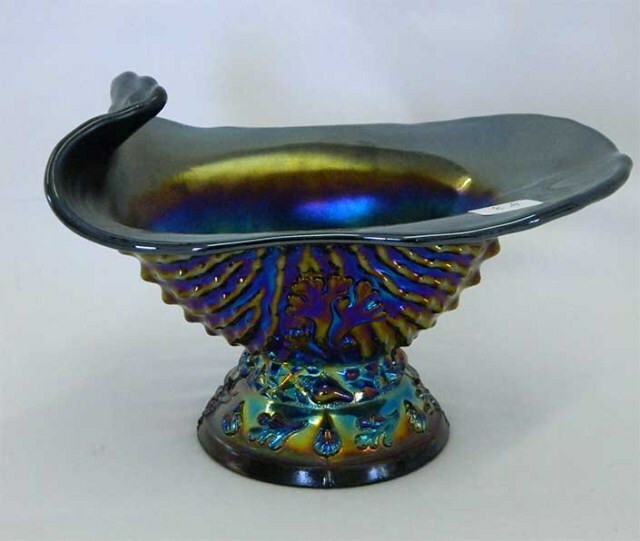 The molds were transferred to Dugan who produced the few limited shapes in carnival. 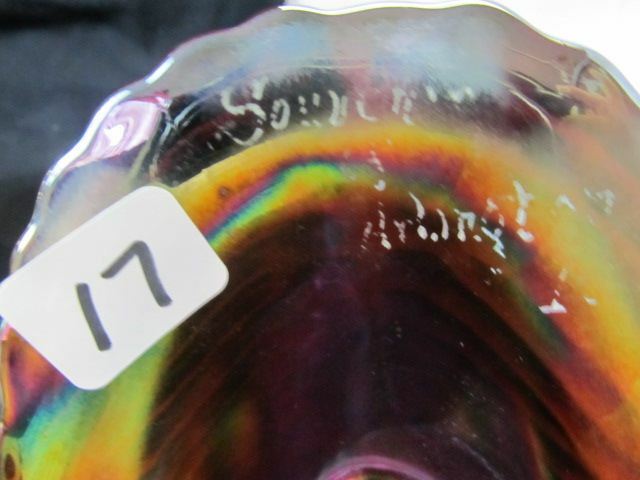 Apparently Dugan did not immediately remove the mark, which is why some pieces are found with the Northwood script. 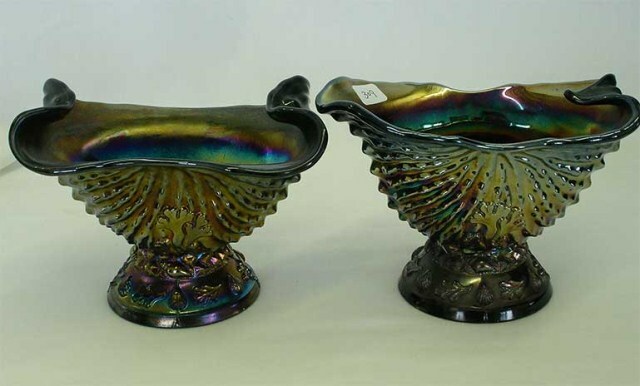 The pieces above are both made from the same mold–the gravy or creamer on the left has one edge pulled up, the sugar on the right two opposite edges pulled up. 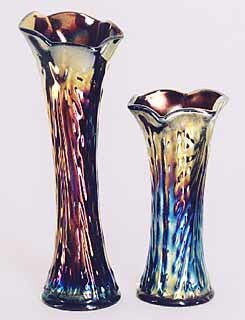 Vases (above left) were made from the tumbler mold, though no tumblers have been found in carnival. 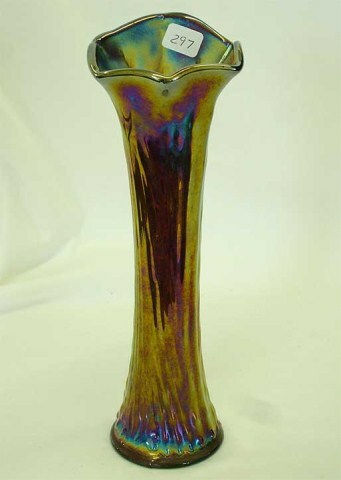 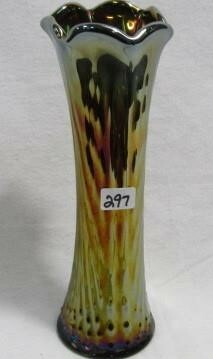 The vases range in height from 6 inches to about 9 inches and marigold is more scarce than purple. 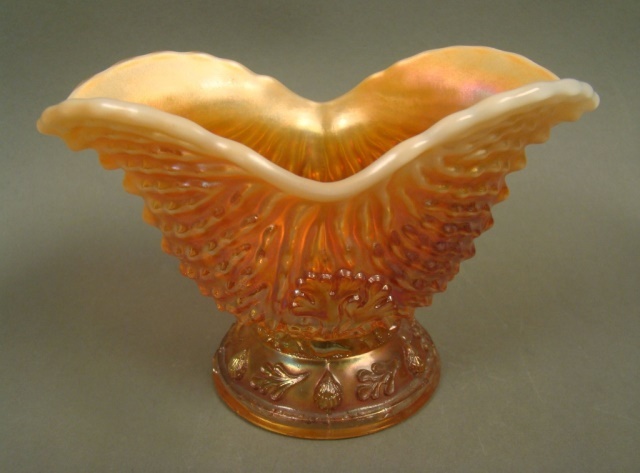 Above middle is a whimsey piece made from the creamer/sugar mold; this peach opal example, stretched to 7 1/2 inches wide, sold for $175 in 1995. 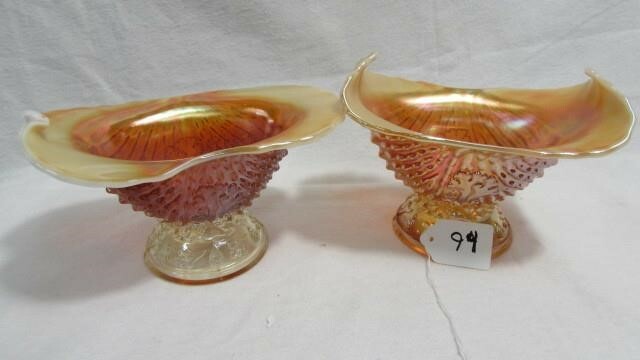 The unusual banana boat (above right) was made from a completely different mold than the creamers/sugars and is considerably larger. 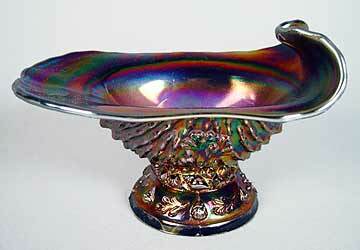 Note that the base is oval shaped. 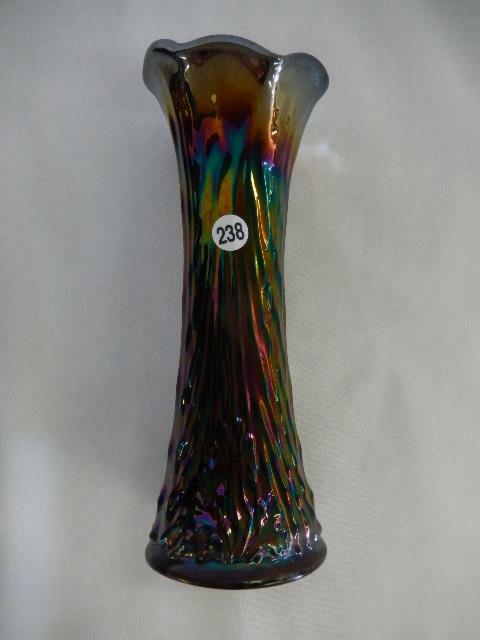 Courtesy of Larry and Mary Yung.